Stacey Pitts Caldwell, director of the Chicagoland Chamber of Commerce's Small Business Development Center, thanked the Quinlan marketing students who worked on the 2018 Chicagoland Small Business Outlook Survey. Small businesses in the Chicago region have growing optimism, plus plans to expand, according to the 2018 Small Business Outlook Survey. This is important as 46 percent of Illinois’ private sector workforce–2.4 million people–are employed by a small business. The annual survey has been conducted by the Chicagoland Chamber of Commerce and Quinlan since 2014. For the 2018 survey, Quinlan graduate marketing students under the direction of assistant marketing professor Alexander Krasnikov, PhD, were engaged during all stages of the project, from survey development to data collection and interpretation. Watch a video summary of the 2018 survey results or read the key results below. In 2018, there is a sharp 8 percent upswing in businesses that say the Chicagoland economy is getting stronger. Such confidence has been lacking in recent years. In 2015, 42 percent of small businesses said the Chicagoland economy strengthened. That figure fell to 28 percent in 2016 and was near flat in 2017 at 29 percent. Confidence is especially strong locally. While confidence in the Chicagoland economy spiked 8 percent, it rose modestly at the Illinois and U.S. levels at 3 percent each. Seventy-one percent of small businesses in the survey expect to see their revenues increase in 2018, a 12 percent spike from last year. Sixty-two percent of small businesses plan to expand their operations within Illinois in 2018, which was another 12 percent increase from last year. Eighteen percent of small businesses plan to expand internationally this year, a 5 percent rise. Forty-two percent of small businesses expect to add full-time employees this year, a 7 percent increase from last year. The fastest growing concern of small businesses in the survey is talent acquisition, which rose 10 percent. Sixty-six percent of small businesses now worry about accessing skilled workers to hire. The cost of health care is the second-fastest growing concern in the survey. It rose 6 percent, and now worries 88 percent of Chicagoland small businesses. 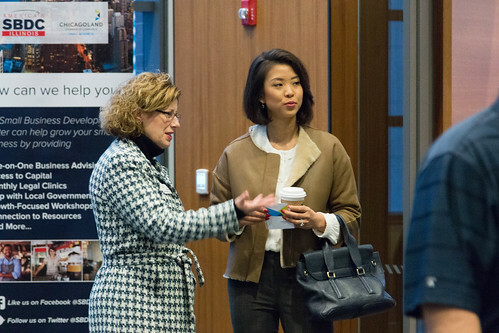 The survey results were revealed at a reception on Wednesday, January 24, at the home of the Quinlan School of Business, the Schreiber Center on Loyola’s Water Tower Campus. View event photos in the gallery below or on the chamber’s Flickr page.